Technology for detecting liver tumors and identifying the bile ducts using indocyanine green (ICG) has recently been developed. 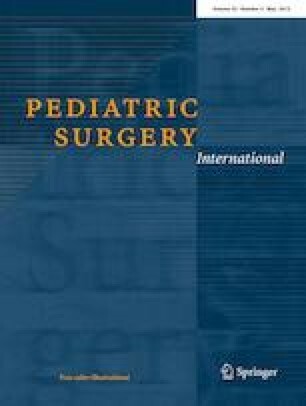 However, the usefulness and limitations of ICG navigation surgery for hepatoblastoma (HB) have not been fully clarified. We herein report our experiences with surgical navigation using ICG for in HB patients. In 5 HB patients, 10 ICG navigation surgeries were performed using a 10-mm infrared fluorescence imaging scope after the injection of 0.5 mg/kg ICG intravenously. The surgical and clinical features were collected retrospectively. Navigation surgery using ICG was performed for primary liver tumors in 4 cases, and the timing of ICG injection was 90.5 ± 33.7 h before the operation. All tumors exhibited intense fluorescence from the liver surface. ICG navigation for the primary liver tumor was useful for detecting the residual tumor at the stump and invasion to the diaphragm during surgery. Six lung surgeries using ICG navigation were performed. The timing of ICG injection was 21.8 ± 3.4 h before the operation. The size of the metastatic tumor was 7.4 ± 4.1 mm (1.2–15 mm). Of 11 metastatic tumors detected by computed tomography (CT), 10—including the smallest tumor (1.2 mm)—were able to be detected by ICG from the lung surface. The depth of the 10 ICG-positive tumors from the lung surface was 0.9 ± 1.9 mm (0–6 mm), and the depth of the single ICG-negative tumor was 12 mm. One lesion not detected by CT showed ICG false positivity. Navigation surgery using ICG for patients with HB was useful for identifying tumors and confirming complete resection. However, in ICG navigation surgery, we must be aware of the limitations with regard to the tumor size and the depth from the surface. The English used in this manuscript was reviewed by Brian Quinn (Editor-in-Chief, Japan Medical Communication).